A microprocessor (sometimes abbreviated µP) is a programmable digital electronic component that incorporates the functions of a central processing unit (CPU) on a single semiconducting integrated circuit (IC). The microprocessor was born by reducing the word size of the CPU from 32 bits to 4 bits, so that the transistors of its logic circuits would fit onto a single part. One or more microprocessors typically serve as the CPU in a computer system, embedded system, or handheld device. Microprocessors made possible the advent of the microcomputer in the mid-1970s. Before this period, electronic CPUs were typically made from bulky discrete switching devices (and later small-scale integrated circuits) containing the equivalent of only a few transistors. By integrating the processor onto one or a very few large-scale integrated circuit packages (containing the equivalent of thousands or millions of discrete transistors), the cost of processor power was greatly reduced. Since the advent of the IC in the mid-1970s, the microprocessor has become the most prevalent implementation of the CPU, nearly completely replacing all other forms. In the future, microprocessors will become smaller. There is a limit to the size of how small they will get. The solution to getting smaller components on smaller chips will eventually not come down to a physical redesign, but a mathematical one. In order to make smaller ones. For example, research in nano-technologies will have to look beyond binary systems (on/off) and look at possibly trinary systems (on/off/neutral). This may not increase the size of memory on a chip but it could open the doors to faster technology. The evolution of microprocessors has been known to follow Moore's Law when it comes to steadily increasing performance over the years. This law suggests that, "the complexity of an integrated circuit, with respect to minimum component cost, doubles every 24 months." This dictum has generally proven true since the early 1970s. From their humble beginnings as the drivers for calculators, the continued increase in power has led to the dominance of microprocessors over every other form of computer; every system from the largest mainframes to the smallest handheld computers now uses a microprocessor at its core. The 4004 with cover removed (left) and as actually used (right). As with many advances in technology, the microprocessor was an idea whose time had come. Three projects arguably delivered a complete microprocessor at about the same time, Intel's 4004, Texas Instruments' TMS 1000, and Garrett AiResearch's Central Air Data Computer. In 1968, Garrett was invited to produce a digital computer to compete with electromechanical systems then under development for the main flight control computer in the U.S. Navy's new F-14 Tomcat fighter. The design was complete by 1970, and used a MOS-based chipset as the core CPU. The design was smaller and much more reliable than the mechanical systems it competed against, and was used in all of the early Tomcat models. However, the system was considered so advanced that the Navy refused to allow publication of the design, and continued to refuse until 1997. For this reason the CADC, and the MP944 chipset it used, are fairly unknown even today. TI developed the 4-bit TMS 1000 and stressed pre-programmed embedded applications, introducing a version called the TMS1802NC on September 17, 1971, which implemented a calculator on a chip. The Intel chip was the 4-bit 4004, released on November 15, 1971, developed by Federico Faggin. TI filed for the patent on the microprocessor. Gary Boone was awarded U.S. Patent 3,757,306 (PDF) for the single-chip microprocessor architecture on September 4, 1973. It may never be known which company actually had the first working microprocessor running on the lab bench. In both 1971 and 1976, Intel and TI entered into broad patent cross-licensing agreements, with Intel paying royalties to TI for the microprocessor patent. A nice history of these events is contained in court documentation from a legal dispute between Cyrix and Intel, with TI as intervenor and owner of the microprocessor patent. Interestingly, a third party claims to have been awarded a patent which might cover the "microprocessor." A computer-on-a-chip is a variation of a microprocessor which combines the microprocessor core (CPU), some memory, and I/O (input/output) lines, all on one chip. The computer-on-a-chip patent, called the "microcomputer patent" at the time, U.S. Patent 4,074,351 (PDF), was awarded to Gary Boone and Michael J. Cochran of TI. Aside from this patent, the standard meaning of microcomputer is a computer using one or more microprocessors as its CPU(s), while the concept defined in the patent is perhaps more akin to a microcontroller. 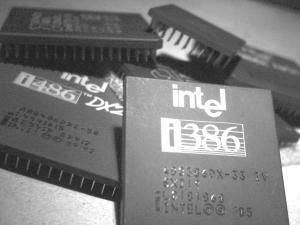 According to A History of Modern Computing, (MIT Press), Intel entered into a contract with Computer Terminals Corporation, later called Datapoint, of San Antonio, Texas, for a chip for a terminal they were designing. Datapoint later decided not to use the chip, and Intel marketed it as the 8008 in April 1972. This was the world's first 8-bit microprocessor. It was the basis for the famous "Mark-8" computer kit advertised in the magazine Radio-Electronics in 1974. The 8008 and its successor, the world-famous 8080, opened up the microprocessor component marketplace. The 4004 was later followed in 1972, by the 8008, the world's first 8-bit microprocessor. These processors are the precursors to the very successful Intel 8080 (1974), Zilog Z80 (1976), and derivative Intel 8-bit processors. The competing Motorola 6800 was released August 1974. Its architecture was cloned and improved in the MOS Technology 6502 in 1975, rivaling the Z80 in popularity during the 1980s. Both the Z80 and 6502 concentrated on low overall cost, through a combination of small packaging, simple computer bus requirements, and the inclusion of circuitry that would normally have to be provided in a separate chip (for instance, the Z80 included a memory controller). It was these features that allowed the home computer "revolution" to take off in the early 1980s, eventually delivering semi-usable machines that sold for US$99. The Western Design Center, Inc. (WDC) introduced the CMOS 65C02 in 1982, and licensed the design to several companies which became the core of the Apple IIc and IIe personal computers, medical implantable grade pacemakers and defibrillators, automotive, industrial, and consumer devices. WDC pioneered the licensing of microprocessor technology which was later followed by ARM and other microprocessor Intellectual Property (IP) providers in the 1990s. Motorola trumped the entire 8-bit world by introducing the MC6809 in 1978, arguably one of the most powerful, orthogonal, and clean 8-bit microprocessor designs ever fielded—and also one of the most complex hardwired logic designs that ever made it into production for any microprocessor. Microcoding replaced hardwired logic at about this point in time for all designs more powerful than the MC6809—specifically because the design requirements were getting too complex for hardwired logic. Another early 8-bit microprocessor was the Signetics 2650, which enjoyed a brief flurry of interest due to its innovative and powerful instruction set architecture. A seminal microprocessor in the world of spaceflight was RCA's RCA 1802 (also called the CDP1802 or RCA COSMAC) (introduced in 1976) which was used in NASA's Voyager and Viking space probes of the 1970s, and onboard the Galileo probe to Jupiter (launched 1989, arrived 1995). RCA COSMAC was the first to implement CMOS technology. The CDP1802 was used because it could be run at very low power, and because its production process (Silicon on Sapphire) ensured much better protection against cosmic radiation and electrostatic discharges than that of any other processor of the era. Thus, the 1802 is said to be the first radiation-hardened microprocessor. Microprocessors, including an Intel 80486DX2 and an Intel 80386. The first multi-chip 16-bit microprocessor was the National Semiconductor IMP-16, introduced in early 1973. An 8-bit version of the chipset was introduced in 1974 as the IMP-8. In 1975, National introduced the first 16-bit single-chip microprocessor, the PACE, which was later followed by an NMOS version, the INS8900. Other early multi-chip 16-bit microprocessors include one used by Digital Equipment Corporation (DEC) in the LSI-11 OEM board set and the packaged PDP 11/03 minicomputer, and the Fairchild Semiconductor MicroFlame 9440, both of which were introduced in the 1975 to 1976 time frame. The first single-chip 16-bit microprocessor was TI's TMS 9900, which was also compatible with their TI-990 line of minicomputers. The 9900 was used in the TI 990/4 minicomputer, the TI-99/4A home computer, and the TM990 line of OEM microcomputer boards. The chip was packaged in a large ceramic 64-pin DIP package package, while most 8-bit microprocessors such as the Intel 8080 used the more common, smaller, and less expensive plastic 40-pin DIP. A follow-on chip, the TMS 9980, was designed to compete with the Intel 8080, had the full TI 990 16-bit instruction set, used a plastic 40-pin package, moved data 8 bits at a time, but could only address 16KB. A third chip, the TMS 9995, was a new design. The family later expanded to include the 99105 and 99110. The Western Design Center, Inc. (WDC) introduced the CMOS 65816 16-bit upgrade of the WDC CMOS 65C02 in 1984. The 65816 16-bit microprocessor was the core of the Apple IIgs and later the Super Nintendo Entertainment System, making it one of the most popular 16-bit designs of all time. Intel followed a different path, having no minicomputers to emulate, and instead "upsized" their 8080 design into the 16-bit Intel 8086, the first member of the x86 family which powers most modern PC type computers. Intel introduced the 8086 as a cost effective way of porting software from the 8080 lines, and succeeded in winning much business on that premise. The 8088, a version of the 8086 that used an external 8-bit data bus, was the microprocessor in the first IBM PC, the model 5150. Following up their 8086 and 8088, Intel released the 80186, 80286 and, in 1985, the 32-bit 80386, cementing their PC market dominance with the processor family's backwards compatibility. The integrated microprocessor memory management unit (MMU) was developed by Childs et al. of Intel, and awarded U.S. patent number 4,442,484. 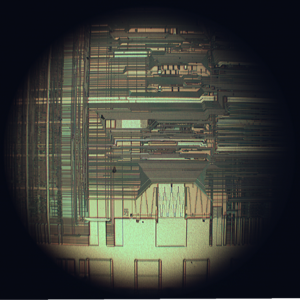 Upper interconnect layers on an Intel 80486 DX2 die. 16-bit designs were in the market only briefly when full 32-bit implementations started to appear. The most famous of the 32-bit designs is the MC68000, introduced in 1979. The 68K, as it was widely known, had 32-bit registers but used 16-bit internal data paths, and a 16-bit external data bus to reduce pin count, and supported only 24-bit addresses. Motorola generally described it as a 16-bit processor, though it clearly has 32-bit architecture. The combination of high speed, large (16 megabyte) memory space and fairly low costs made it the most popular CPU design of its class. The Apple Lisa and Macintosh designs made use of the 68000, as did a host of other designs in the mid-1980s, including the Atari ST and Commodore Amiga. The world's first single-chip fully-32-bit microprocessor, with 32-bit data paths, 32-bit buses, and 32-bit addresses, was the AT&T Bell Labs BELLMAC-32A, with first samples in 1980, and general production in 1982. After the divestiture of AT&T in 1984, it was renamed the WE 32000 (WE for Western Electric), and had two follow-on generations, the WE 32100 and WE 32200. These microprocessors were used in the AT&T 3B5 and 3B15 minicomputers; in the 3B2, the world's first desktop supermicrocomputer; in the "Companion," the world's first 32-bit laptop computer; and in "Alexander," the world's first book-sized supermicrocomputer, featuring ROM-pack memory cartridges similar to today's gaming consoles. All these systems ran the UNIX System V operating system. Intel's first 32-bit microprocessor was the iAPX 432, which was introduced in 1981, but was not a commercial success. It had an advanced capability-based object-oriented architecture, but poor performance compared to other competing architectures such as the Motorola 68000. Motorola's success with the 68000 led to the MC68010, which added virtual memory support. The MC68020, introduced in 1985 added full 32-bit data and address busses. The 68020 became hugely popular in the Unix supermicrocomputer market, and many small companies (for example, Altos, Charles River Data Systems) produced desktop-size systems. Following this with the MC68030, which added the MMU into the chip, the 68K family became the processor for everything that wasn't running DOS. The continued success led to the MC68040, which included an FPU for better math performance. A 68050 failed to achieve its performance goals and was not released, and the follow-up MC68060 was released into a market saturated by much faster RISC designs. The 68K family faded from the desktop in the early 1990s. Other large companies designed the 68020 and follow-ons into embedded equipment. At one point, there were more 68020s in embedded equipment than there were Intel Pentiums in PCs. The ColdFire processor cores are derivatives of the venerable 68020. During this time (early to mid 1980s), National Semiconductor introduced a very similar 16-bit pinout, 32-bit internal microprocessor called the NS 16032 (later renamed 32016), the full 32-bit version named the NS 32032, and a line of 32-bit industrial OEM microcomputers. By the mid-1980s, Sequent introduced the first symmetric multiprocessor (SMP) server-class computer using the NS 32032. This was one of the design's few wins, and it disappeared in the late 1980s. The MIPS R2000 (1984) and R3000 (1989) were highly successful 32-bit RISC microprocessors. They were used in high-end workstations and servers by SGI, among others. Other designs included the interesting Zilog Z8000, which arrived too late to market to stand a chance and disappeared quickly. In the late 1980s, "microprocessor wars" started killing off some of the microprocessors. Apparently, with only one major design win, Sequent, the NS 32032 just faded out of existence, and Sequent switched to Intel microprocessors. From 1985 to 2003, the 32-bit x86 architectures became increasingly dominant in desktop, laptop, and server markets, and these microprocessors became faster and more capable. Intel had licensed early versions of the architecture to other companies, but declined to license the Pentium, so AMD and Cyrix built later versions of the architecture based on their own designs. During this span, these processors increased in complexity (transistor count) and capability (instructions/second) by at least a factor of 1000. While 64-bit microprocessor designs have been in use in several markets since the early 1990s, the early 2000s have seen the introduction of 64-bit microchips targeted at the PC market. With AMD's introduction of the first 64-bit IA-32 backwards-compatible architecture, AMD64, in September 2003, followed by Intel's own x86-64 chips, the 64-bit desktop era began. Both processors can run 32-bit legacy apps as well as the new 64-bit software. With 64-bit Windows XP and Linux that run 64-bit native, the software too is geared to utilize the full power of such processors. The move to 64 bits is more than just an increase in register size from the IA-32 as it also doubles the number of general-purpose registers for the aging CISC designs. The move to 64 bits by PowerPC processors had been intended since the processors' design in the early 90s and was not a major cause of incompatibility. Existing integer registers are extended as are all related data pathways, but, as was the case with IA-32, both floating point and vector units had been operating at or above 64 bits for several years. Unlike what happened with IA-32 was extended to x86-64, no new general purpose registers were added in 64-bit PowerPC, so any performance gained when using the 64-bit mode for applications making no use of the larger address space is minimal. AMD X2 3600 Dual core processor. A different approach to improving a computer's performance is to add extra processors, as in symmetric multiprocessing designs which have been popular in servers and workstations since the early 1990s. Keeping up with Moore's Law is becoming increasingly challenging as chip-making technologies approach the physical limits of the technology. In response, the microprocessor manufacturers look for other ways to improve performance, in order to hold on to the momentum of constant upgrades in the market. A multi-core processor is simply a single chip containing more than one microprocessor core, effectively multiplying the potential performance with the number of cores (as long as the operating system and software is designed to take advantage of more than one processor). Some components, such as bus interface and second level cache, may be shared between cores. Because the cores are physically very close they interface at much faster clock speeds compared to discrete multiprocessor systems, improving overall system performance. 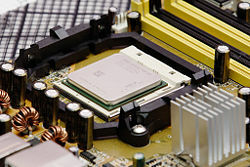 In 2005, the first mass-market dual-core processors were announced and as of 2006, dual-core processors are widely used in high-end servers and workstations while quad-core processors for servers are beginning to become available. In the mid-1980s to early-1990s, a crop of new high-performance RISC (reduced instruction set computer) microprocessors appeared, which were initially used in special purpose machines and Unix workstations, but have since become almost universal in all roles except the Intel-standard desktop. The first commercial design was released by MIPS Technologies, the 32-bit R2000 (the R1000 was not released). The R3000 made the design truly practical, and the R4000 introduced the world's first 64-bit design. Competing projects would result in the IBM POWER and Sun SPARC systems, respectively. Soon every major vendor was releasing a RISC design, including the AT&T CRISP, AMD 29000, Intel i860 and Intel i960, Motorola 88000, DEC Alpha, and the HP-PA.
Market forces have "weeded out" many of these designs, leaving the PowerPC as the main desktop RISC processor, with the SPARC being used in Sun designs only. MIPS continues to supply some SGI systems, but is primarily used as an embedded design, notably in Cisco routers. The rest of the original crop of designs have either disappeared, or are about to. Other companies have attacked niches in the market, notably ARM, originally intended for home computer use but since focussed at the embedded processor market. Today RISC designs based on the MIPS, ARM, or PowerPC core power the vast majority of computing devices. As of 2006, several 64-bit architectures are still produced. These include x86-64, MIPS, SPARC, Power Architecture, and IA-64. Though the term "microprocessor" has traditionally referred to a single- or multi-chip CPU or System-on-a-chip (SoC), several types of specialized processing devices have followed from the technology. The most common examples are microcontrollers, Digital Signal Processors (DSP) and Graphics processing units (GPU). Many examples of these are either not programmable, or have limited programming facilities. For example, in general GPUs through the 1990s were mostly non-programmable and have only recently gained limited facilities like programmable vertex shaders. There is no universal consensus on what defines a "microprocessor," but it is usually safe to assume that the term refers to a general-purpose CPU of some sort and not a special-purpose processor unless specifically noted. The RCA 1802 had what is called a static design, meaning that the clock frequency could be made arbitrarily low, even to 0 Hz, a total stop condition. This let the Voyager/Viking/Galileo spacecraft use minimum electric power for long uneventful stretches of a voyage. Timers and/or sensors would awaken/speed up the processor in time for important tasks, such as navigation updates, attitude control, data acquisition, and radio communication. In 2003, about $44 billion (USD) worth of microprocessors were manufactured and sold. Although about half of that money was spent on CPUs used in desktop or laptop personal computers, those count for only about 0.2 percent of all CPUs sold. About 55 percent of all CPUs sold in the world are 8-bit microcontrollers. Over 2 billion 8-bit microcontrollers were sold in 1997. Less than 10 percent of all the CPUs sold in the world are 32-bit or more. Of all the 32-bit CPUs sold, about 2 percent are used in desktop or laptop personal computers, the rest are sold in household appliances such as toasters, microwaves, vacuum cleaners, and televisions. Crisp, John. 2004. Introduction to Microprocessors and Microcontrollers. Burlington, MA: Newnes. ISBN 0750659890. Tocci, Ronald J., an Frank J. Ambrosio. 2002. Microprocessors and Microcomputers: Hardware and Software. Upper Saddle River, NJ: Prentice Hall. ISBN 0130609048. Stokes, Jon. 2006. Inside the Machine: An Illustrated Introduction to Microprocessors and Computer Architecture. San Francisco: No Starch Press. ISBN 1593271042. This page was last modified on 3 October 2018, at 16:56.